To discover Florence through its buildings, its monuments, and its museums is certainly an effective way to experience the charm of the Medici city that has remained intact over the centuries. To visit its historic cafés, however, is tantamount to catching a glimpse of its soul and its history. Indeed, the fortune of some of the most famous streets and squares of Florence is linked precisely to these important meeting places. This is the case with Piazza della Repubblica, one of the most beautiful squares of Florence. Contrary to what you may think, the square’s fame is not due to its architecture and famous arch, but to its literary cafes: Le Giubbe Rosse, Gilli and Caffè Paszkowski. All three were involved to varying degrees in one of the biggest cultural phenomena of the twentieth century – Futurism – the literary and artistic movement dedicated to the myths of modernity, strength, speed, and power, as incarnations of technology and progress. Le Giubbe Rosse opened in 1827, and took its name from the clothes of the waiters who wore red coats. In the early years of the 1900s, it was the favorite of many intellectuals of the time. However, after the publication of the Futurist Manifesto of 1909, it became the seat of the Florentine Futurists, in particular Filippo Tommaso Marinetti, Umberto Boccioni and Carlo Carra, and later became a meeting place for writers and artists, both Italian and foreign. It was initially a chess club – it is said that Lenin was a frequent guest – and really never lost this label. In the period between the two world wars, it was home to the famous magazine “Solaria,” which introduced Italians to writers like Joyce, Kafka and Virginia Woolf. 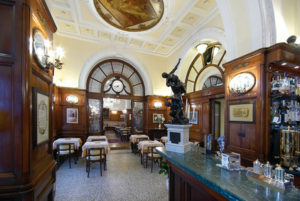 Its walls are still decorated with Futurist and Neo-Futurist paintings in an elegant, yet casual, setting where one can taste the typical dishes of Florence. There are also many photos, drawings and memories of its famous patrons. It is still a center of culture and art. Caffè Concerto Paszkowski opened in 1846 as a brewery, but it soon became a café where the Concerto Paszkowski performed as well as a famous all-female orchestra, rare for the time. Again, this café-brasserie soon became a meeting place of the leaders of literature and art of the early 1900s; after the war, its musical vocation turned decisively towards cabaret. Even today this ancient musical tradition is well represented by the artists who perform there. There are also conferences and fashion shows, while its tea rooms are a must for foreign visitors who want to have a break. In 1991 it was declared a national monument. 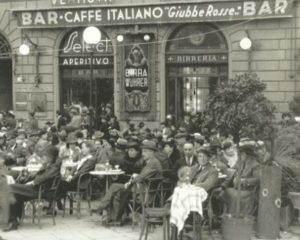 At the beginning of the century, Caffè Gilli was an elegant meeting place, frequented by artists and intellectuals such as Marinetti and Soffici. A café in the Belle Époque style with ivory-colored walls, Murano glass chandeliers, painted ceilings, and arches that confirm the good taste and the warmth of the Florentines. Many photographs of international artists are immortalized within its halls. But it is outside the Caffè Gilli where Ruth Orkin’s famous photograph entitled American Girl in Italy 1951 was taken. The photo, which portrays the twenty-three year old American Ninalee Craig walking on the sidewalk in front of the bar, surrounded by the admiring glances of his young visitors, became in time a well-known icon of cinema and photography.